I understand we have to defend our country and protect all our good stuff…but wouldn’t you think that a nation with Christian values could at least make an honest effort at demonstrating the justice for all we so loudly proclaim? Am I the only one who thinks we could lower our defense spending by $30 Billion or so, end world hunger, and still feel pretty confident we have all the security we need? This entry was posted in Facts & Statistics, Hunger & Poverty, Quotes and tagged Christian values, defense spending, justice, priorities, security, world hunger on February 24, 2015 by Ray Buchanan. Thanks, my friend. Our national priorities are way off. Ending hunger around the world is a bargain at twice the price. 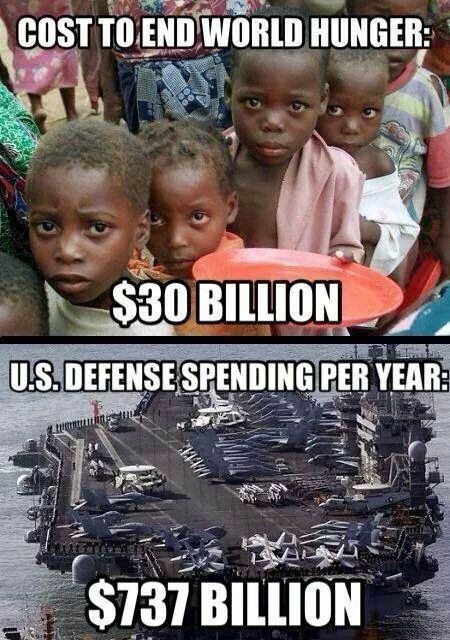 We will never have true global security until the poor have bread. That is a foundation for building a just and sustainable society.